Bondora provides individual loans. The yearly interests rates vary greatly depending on the borrower’s profile; they can be as high as 200% (!) for the most speculative ones. Of course, given their sometimes insane interest rates level, these loans don’t come with a buyback guarantee, and the default rate is huge. If the interest rate can be very high, the resulting default rate is correlated; as such, the final performance is deceiving. A huge volume of loans is available on Bondora. Many statistics are available, but they’re not really useful. The website is overall pleasant to use. There’s a specific review for Bondora’s Go & Grow, where I compare it to Mintos predefined strategies and DoFinance. Most P2P lending sites allow you to specify at least a risk level and a desired interest rate and often have a granularity by country. Unlike those, Bondora‘s Portfolio Manager only lets you choose an investment profile, and gives you an estimation of the expected return. This estimation should really be taken with a pinch of salt; I have yet to read a review of Bondora where the expected returns were met. 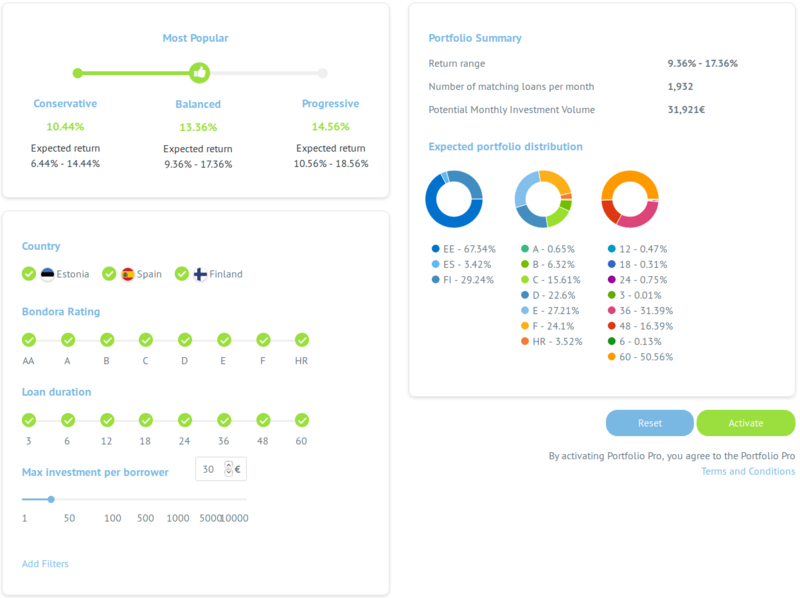 Auto-invest is actually called Portfolio Pro at Bondora. It allows you to configure the desired country, borrower’s rating, loan duration and maximal investment by broker. Given these parameters, it estimates the returns and matching loans volume. Browsing the website is straightforward and it’s easy to find what you need. You also have the opportunity to create reports like the list of your investments, account statement, tax report… and export them as Excel files. That’s very handy for those who want to compute statistics themselves ! Initially, the expected performance of my Bondora portfolio was above 16%. In reality, as of November 2018 it currently stands below 10% and sinks a bit more each month. Bondora’s advise is that investors should keep on investing, as recoveries are supposed to improve the performance later. I’m totally unconvinced by this response, and started cutting the size of my portfolio. Anyone over the age of 18 living in the European Union, Switzerland or Norway and businesses registered in the EU or from any other country approved by Bondora. If you are an investor from Australia, Brazil, Canada, Hong Kong, India, Japan, South Korea, Mexico, Singapore, South Africa or The United States of America then we need to verify that you are an “accredited investor”. As part of the verification process we ask you to send us different information and documents. I was considering investing in Bondora but have seen some awful reviews lately, they seem to have a huge number of loans defaulting compared to their competitors. Do not recomend. I ran auto portfolio for TWO YEARS – statistics shows 12% per year and basicly 26% more account value than in the begining. But…. Tried to exit and it comes out that almost almost half of my portfolio consist of RED loans some are 2 years old with zero payed back .RED are hard to sell even with 60% discount. Bondora still callculates them as 100% value of loan. So that portfolio looks bigger and more profitable than it really is.